Budget SLRs - by which we mean reflex cameras with inter-changeable lenses under £700 - are still popular, as they offer superb quality and flexibility at keen prices. Sony has shied away from this market so far, lacking the lens credibility to take on the big camera firms, but its acquisition of Konica Minolta's camera business in January changed that. 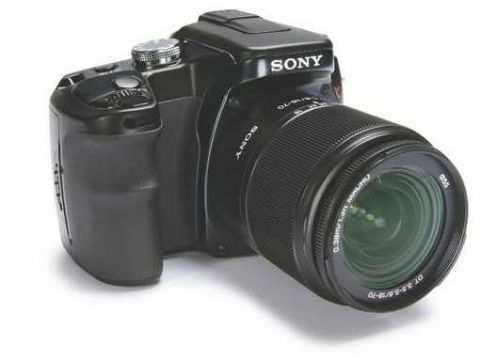 The Alpha is Sony's first budget SLR and takes its cues from the discontinued but wellregarded Konica Minolta 5D SLR. In terms of technology, the Sony is cutting-edge. As well as a state of the art 10 megapixel sensor, it comes with powerful antishake technology and the oddly named Bionz image-processor to extend the camera's dynamic range. Another welcome addition is anti-dust technology, to reduce the risk of dust getting into the camera when you change lenses. The lens has a fancy coating and the sensor momentarily vibrates at high speed when you turn it on. We also like the supplied lens, which at 18-70mm, is longer than you get with the Nikon D50 or the Canon EOS400D. It's good quality, too, with minimal aberration. So why aren't we hailing the Sony as the new budget SLR king? For several reasons. Even at a discounted £600, we think it's pretty expensive when you can bag the superb Nikon D50 for £200 less. The D50 has fewer megapixels and a shorter lens, but these aren't deal breakers - the D50 takes fantastic shots out of the box. The Alpha also suffers from more noise than we would like, too, particularly when taking indoor shots. While it's not a major problem, you can get better picture quality for less.